You’re all geared up for Africa cup of nations –or, if football isn’t your thing, maybe you’re anticipating the IAAF world championships. Either way, you have your pizza, your beer, or you’re brand-new, beautiful OLED TV. But is that OLED giving your ultimate immersive experience? This year, LG will be upscaling their experience on the OLED Television. Your first thought may be to wonder why your TV needs its own AI, but LG’s goal is to make it easier to interact with your entertainment. Instead of pulling out your smartphone to look up other movies an actor has been in, you can just ask LG’s ThinQ voice interface to show you movies the actor on screen has been in. The AI does the rest, figuring out who you’re talking about and compiling a list of movies. Al ThinQ’s smarts mean it can tell what you want no matter how you phrase it, cutting out the frustration of voice controls that don’t always understand you. While you could ask Apple’s Siri, Amazon’s Alexa or Google’s Assistant the same questions, none of them would understand what you’re talking about — your LG TV, on the other hand, will. However, LG notes that “The Gen 2 Al can further be able to interact with your TV, too. That means you may be able to use your favorite voice assistant (LG’s existing smart home devices which are already compatible with Google Assistant and Amazon Alexa) to talk to your LG TV. But these are still TVs we’re talking about: it doesn’t matter how smart a television is if it can’t provide a great picture. But LG’s sets have always impressed us — and this year’s lineup promises even better pictures. LG’S MEA CEO Mr James Lee say that “in addition to content source detection, the new processor finely adjusts the tone mapping curve in accordance with ambient conditions to offer optimized screen brightness, leveraging its ability to understand how the human eye perceives images in different lighting. 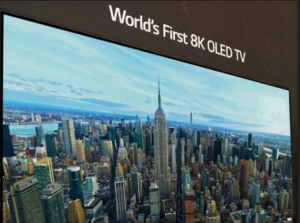 Automatically adjusting brightness to compensate as needed.” LG’s latest 8K OLED and, LG’s new 8KThinQ TV lineup is poised to offer some of the best TVs we’ve seen yet.